The land of Holodrum is slowly withering . Onox, the General of Darkness, has imprisoned the Oracle of Seasons and is draining the very life out of the land. With the seasons in tumult and the forces of evil running rampant, the world looks for a hero...and finds Link. His quest won't be easy--he'll have to master the seasons themselves if he's to turn back the evil tide. • Wield the Rod of Seasons! Changes in weather open new paths and reveal hidden mysteries! • Use tons of items! Link will master new items like Mystical Seeds and over 60 Magical Rings as well as classic tools like Roc's Feather and the power bracelet. • Link gets reinforcements! Fly, swim and jump to new heights with all-new characters like Moosh the winged bear, Ricky the marsupial, and Dimitri the Dodongo! • Link with The Legend of Zelda: Oracle of Ages! Friends and enemies will travel between the two games, passwords can upgrade or transport your items, and only by linking can you discover the evil force behind the chaos. 04-15-2016 mrfoxhound Box Text A Hero for all Seasons The land of Holodrum is slowly withering . Onox, the General of Darkness, has imprisoned the Oracle of Seasons and is draining the very life out of the land. With the seasons in tumult and the forces of evil running rampant, the world looks for a hero...and finds Link. His quest won't be easy--he'll have to master the seasons themselves if he's to turn back the evil tide. • Wield the Rod of Seasons! Changes in weather open new paths and reveal hidden mysteries! • Use tons of items! Link will master new items like Mystical Seeds and over 60 Magical Rings as well as classic tools like Roc's Feather and the power bracelet. • Link gets reinforcements! Fly, swim and jump to new heights with all-new characters like Moosh the winged bear, Ricky the marsupial, and Dimitri the Dodongo! • Link with The Legend of Zelda: Oracle of Ages! Friends and enemies will travel between the two games, passwords can upgrade or transport your items, and only by linking can you discover the evil force behind the chaos. 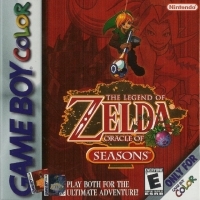 This is a list of VGCollect users who have Legend of Zelda, The: Oracle of Seasons in their Collection. 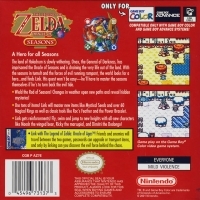 This is a list of VGCollect users who have Legend of Zelda, The: Oracle of Seasons in their Sell List. 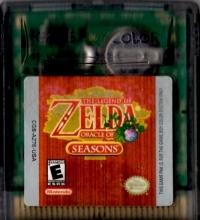 This is a list of VGCollect users who have Legend of Zelda, The: Oracle of Seasons in their Wish List.